The 2008 Eastern CMP Games and Creedmoor Cup Matches will be held from May 3rd through May 11th at Camp Butner in Stem, NC. The CMP Games for Garands, Springfields and vintage military rifles run from 3-6 May. Following that, Service Rifle and Highpower shooters will compete in the Creedmoor Cup Matches from May 7th through 11th. Creedmoor Cup events include an advanced clinic, followed by a Practice Match, a Long Range Match, the 80-shot Creedmoor Cup Match and a team match. Both events feature special hospitality events and prize awards. All interested shooters, whether new shooters or experienced competitors, recreation-oriented shooters or national championship contenders, are invited to participate in these unique, national-level competitions. For more info, contact Laurie Mandell, (419) 635-2141 x1107. CLICK HERE for CMP Games/Creedmoor Cup INFO Page. Share the post "2008 Eastern CMP Games and Creedmoor Cup Matches"
Help keep your prized firearms in good condition with products that keep moisture off guns stored in your safe. Now through April 30, 2008 MidwayUSA has Goldenrod heating units and desiccant packs on sale. The 40 gram desiccant box, item 799452, is now on sale for $3.99. Containing hydrosorbant Silica Gel in an aluminum shell, each unit protects up to 3 cubic feet of storage space. 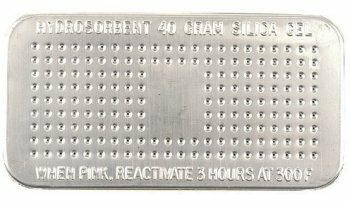 These desiccant packs can be “recharged” by placing them in an oven for 3 hours at 300° F.
The Goldenrod is a safe, electric heating element that will help prevent rust and corrosion. MidwayUSA has an 18″ unit, item 614184, on sale for $15.99 that will warm and protect up to 200 cubic feet. GoldenRods are marketed as “dehumidifiers”, but that is a bit of a misnomer. The GoldenRod doesn’t absorb moisture like a desiccant per se. It works by maintaining a constant temperature inside your safe that raises the dew point and alters the relative humidity so that water vapor doesn’t condense on your firearms. Share the post "Rust-Fighters for GunSafes on Sale"